Maria Jose is a Postgraduate Diploma in Bioscience Enterprise from the University of Auckland and a Biotechnology Engineer from Universidad Andres Bello in Chile. While developing her undergraduate studies and along with other partners, she founded VidaOx, a small Chilean Venture related with Biotechnology and Food technology. She has also been involved in research related to Aquaculture, Environmental Biotechnology, Biomedicine and Plant Biotechnology. 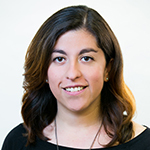 Since 2017, Maria Jose has been working at Auckland UniServices as a Commercialisation Analyst. During this time she has also joined Micro-CV, a Computer Vision Venture from the Auckland Bioengineering Institute that the runner up position at Velocity 2017, as well become the National Business Development and Partnerships Lead for Chiasma, a student led organization that ties Industry with STEM students. Maria Jose was part of the first generation of Momentum Investment Committee members and previous experiences also include working in Venture Capital. Broader interests include volunteering, mentoring, and finishing her Masters in Bioscience Enterprise.